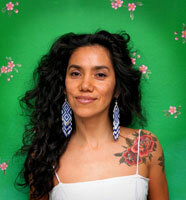 To learn more about Yuyi, you can visit her website: yuyimorales.com . You can also follow her Blog, Facebook Page, and Twitter. Discovering books lighted my fire. Which books, that were your favorites when you were little, have had the greatest influence on your work? I grew up in Mexico in the 60’s and at the time Mexico simply didn’t have a children’s literature that I, or any other children, could have access to or fall in love with. So instead I grew up reading comic magazines such as Archie, and La Familia Burron, and also many adult graphic magazines my relatives bought weekly. My other library was the encyclopedia my mother bought for my sisters and I. From my parents’ bookshelves I also read many books for adults, most of much I failed to truly understand, but that often left me very impressed. Some of my favorite books from my early years were Platero y Yo, by Juan Ramón Jiménez’s, La Rosa y el Ruiseñor, by Oscar Wilde, and when I was about 12 years old, I had my first encounter with the short Stories of Gabriel Garcia Marquez, who intermediately became the biggest inspiration in my life. Please share an instance in which you had an idea or experience, that started out small, but took root and grew to become a book. At my writer’s critique group, The Revisionaries, we have an annual tradition where we write a new book by randomly puling words or phrases from a hat. We use this words as trigers, and we have the next couple of weeks until our last meeting of December to come up with a story inspired in this words. Several of my books, including Little Night, Niño Wrestles the World, and Viva Frida (which will be published in 2014) have been born from that tradition. Some of the prompts we have used are words or phrases such as “one word”, “the lost thing”, “hairdos”. “the hideous thing”, “banned book”, “the way”, and “baby book”. The year I wrote my book Niño Wrestles the World, the prompting words out of the hat read “the time”. We are free to use these words as we need them, they can be mentioned in the story, or they can inspire the book, or anything that would make us create. I have found that there are many stories inside each one of us waiting for their chance to come out, and in my case when I use one of those assigned ideas, what happens is that the stories inside me attach themselves to the prompting words, and the stories begin to take shape as I work on integrating them together. Can you guess how the words “the time” helped me come up with the story of Niño? I’ll give you a clue, look at the page after Niño has defeated the Chamuco, as he looks up and realizes that something dreadful is about to happen. Do you ever hide little images, names or personal details in your illustrations? Please give us a peek. I love filling my books with people I know, or that I know of. For instance, in the illustrations of Los Gatos Black on Halloween, written by Marisa Montes, I put a lot of the dead popular characters that I brought back from my childhood and from my country of birth, Mexico. I have the famous Mexican muralist Diego Rivera there with his dead, cold eyes, holding his brushes, and doing a stiff dance. I also included Josefa Ortíz de Domínguez, a freedom fighter from the movement of independence of Mexico. I also have El Pachuco, because what would be a Halloween dance without a pachuco dancer? I based that character on Tin Tán, a very popular Mexican actor and comedian whose movies I used to watch when I was a child. Some readers might be familiar with Cantinflas, another Mexican comedian and actor who was very popular for embodying the character of the everyday man in Mexico. Not only I painted Cantinflas in the book as one of the goths, but in the cemetery scene I included a reference to his tombstone with the inscription he always wanted to have (but didn’t get). Other characters include a Pre-Hispanic shaman dancing, my aunts Yola and Coti as the witches, Mexican dictator Porfirio Diaz, the skeleton of freedom fighter Simon Bolivar, an Olmec head, a Zihuateteo goddess, the skeleton of my dog Luna, and my son and I coming out of our tombs. Well, no caffeine for me. My day starts with fruit and yogurt, and yes, I could not properly start my day without this sweet meal. It also begins with my three dogs whining, licking, jumping, begging that we start the day! I usually have my yogurt on my desk, where I check and answer emails, and read articles I find interesting, or search for images that inspire my day. If I have to do some writing or to answer an interview such as this one, I usually do it during the beginning of my working day. Later, when I have put my desk and my work in order, and usually after having lunch, I begin to draw or paint or build a puppet or sew a costume or write a story or anything that requires all of my creative concentration. Some breaks, of course, are demanded of me because my dogs like to play and eat and wrestle and go on walks, and things like that. I work until around 7 when most days I change into my dancing clothes and I drive or take the train to Oakland or San Francisco (I live in the suburbs) for a sweaty Vogue or House or African or Brazilian dance class. I usually return home around 11 pm. I might spend some more time with my family, or I might go back to my desk and work some more, or I might simply have dinner and go to bed reading a book. Would you tell me about your first experience as an author-illustrator? How did it happen? Who gave you that chance? I decided to take a night class to learn to illustrate picture books, and our instructor’s first assignment was to come up with a concept story, alphabet, or counting book that we would use to create illustrations. Because the class was for illustrating, our teacher didn’t want us to spend a lot of time writing, so she gave us a week to bring the story and some sketches. With no time to spare I decided to do a counting book. But what to count? And, who would do the counting? I had always loved the traditional folktales from my country. I specially love those where ordinary folks defeat great enemies, like death. So, taking inspiration from the Mexican tradition, and having counting and death in mind, I wrote my story about a grandmother who wakes up one morning to find a skeleton waiting for her at the door. Soon after having written the story and created a dummy with sketches, I learned that the SCBWI (Society of Children’s Books Writer’s and Illustrators) was offering a grant to help spiring illustrators like me, and I decided to submit my story and my illustrations. And I won! Winning the grant gave me the courage to submit my story to publishers, and I received numerous responses from editors, most of them telling me that they really liked my work, but that they thought that a book for children about death and with an skeleton as one of the main characters was way too scary for them to publish. It took more than a year of submitting for me to find no one but two brave publishers who became interested in my book idea. After some negotiations (and changes in my story to make it less scary, I was told), Chronicle Books became the publisher of my book Just a Minute: A trickster Tale and Counting Book, who came to win numerous mentions and awards, and which, I am happy to report, seems not to have scared any children so far. And it never will! Muchas gracias, Yuyi! It was so wonderful have you. You can learn more about the Series and the guests to this blog here. I thoroughly enjoyed Yuyi’s interview. I love that she discovered her gift for both writing & illustrating – and persisted in finding a publisher, etc. for her first book. She inspires me in my dream to do both. Yuyi’s story is so inspiring! Such gorgeous art. Wow! Just, wow!